The church of the Holy Innocents is not the first church at High Beach. 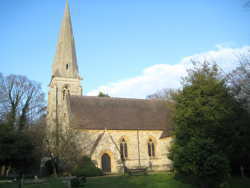 There was previously a church dedicated to St Paul down Church Road, north east, and across the road from Fair Mead Cottage. In 1845, only nine years after it was built, the St Paul's was already closed undergoing repairs. By 1869 the state of St Paul's was such that the vicar and wardens were already planning its replacement and in the 1873 a new church was built, paid for by Thomas Baring (of the banking family) on the condition he could decide what it should look like. White's Directory, 1863 says of High Beech: "Its Church, dedicated to St. Paul, was built by subscription in 1836, at a cost of about £900." The Post Office Directory, 1878: "High Beech is 3 miles south-east [of Waltham Abbey], and is an ecclesiastical parish, formed in 1837, and is situate on the boarders of Epping Forest, about 12 miles from London. The church of St. Paul, now in disuse, is a plain brick building, with bell turret and 1 bell. Holy Innocents church, opened for divine service in 1873, is a gothic stone building, consisting of 13 bells, which are played by machinery. The register dates from the year 1837." By 1933 the parish has developed somewhat and the design of the church such that the following lengthy entry in Kelly's Essex Directory, 1933 reads: "High Beech, 3 miles south-east from Waltham Abbey, and is an ecclesiastical parish, formed in 1837 from that parish and is on the borders of Epping Forest, 2 miles north from Loughton station on the London and North Eastern railway, 3 north from Chingford and about 12 from London, in the Epping division of the county, half hundred of Waltham, Waltham Abbey county court district, Metropolitan police district, rural deanery of Chigwell, archdeaconry of Southend and Chelmsford diocese.. The church of St. Paul, disused for some time, was finally removed, and superseded, by an Order of Council, Dec. 2nd, 1884, by the new church of the Holy Innocents, all rights and emoluments atached to the ancoent church being transferred to the new. 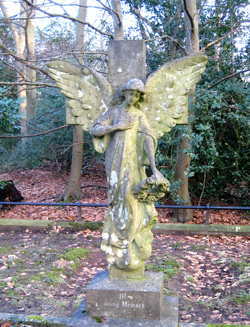 Holy Innocents church, picturesqely situated in the forest and surrounded by woodland scenery, was opened for divine service in 1873 and consecrated in 1883: it is a cruciform edifice of stone in the Gothic style , from designs by the late Sir A.W.Blomfield M.A., A.R.A., F.S.A. architect, of London, and consists of apsidal chancel, nave, transepts, south porch and a north-west tower with octagonal spire containing a clock and 13 bells, played by machinery: the chancel windows, all of which are stained, were the gift of the late T.C.Baring esq. : a memorial window was inserted in 1893 by Mrs Baring in memory of her husband, T.C.Baring M.P. and there is another to Mrs Baring and her children: a marble tablet was placed on the north wall of the nave in 1919 to the men who fell in the Great War, 1914-1918: there are 247 sittings: the lych gate, erected in 1898, is a memorial to Mr & Mrs Arrowsmith of this parish. The register of baptisms and marriages dates from the year 1837 and that for burials from 1884." Thomas Charles Baring died in 1891 and Mrs Baring had a memorial window to her husband inserted in the church in 1893. There is another to Mrs Baring and her children. A marble war memorial was placed on the north wall in 1919. 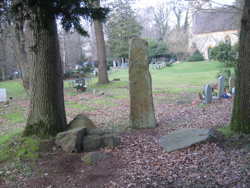 For the purpose of gathering monumental inscriptions, the graveyard has been split into four sections. 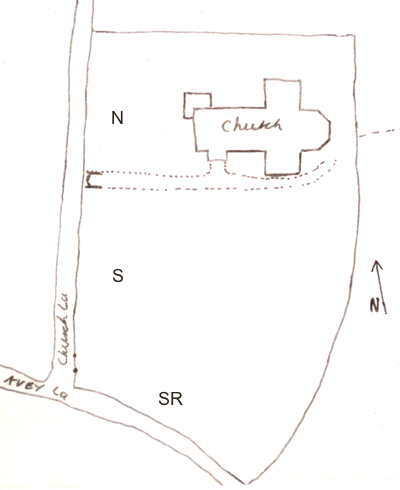 Reference numbers have been assigned to each plot in order to locate them in the church yard and relate them to a transcription, but these do not correspond to church records. 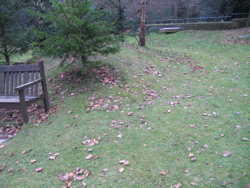 Rows are assigned a letter starting on the Church Lane side, and a number increasing from the path between the lych gate and the church. Most monumental inscriptions were recorded in 2014 by photographing each plot and transcribing later. 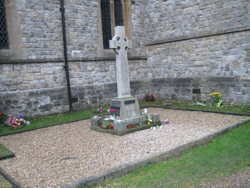 The condition of memorials is generally good making most easy to read. A few memorials south of the church are more difficult to read and require further work to transcribe. Baptism registers 1837-1961, marriage registers 1838-2003, and the burial register 1884-1985 have been deposited with the ERO and may be viewed on-line. The burial register has been transcribed and is available to search on this site.